The bus stop for the 99 B-Line at Commercial–Broadway Station will move back to its original location, outside of Shoppers Drug Mart, on Friday, September 2. Earlier this year, we moved the 99 stop location so construction crews could use the area to relocate utilities and build support columns for the new walkway over Broadway. We are happy to report that this work is now complete! Queueing lines will also be repainted, making it easier for passengers to board buses and keep sidewalk space available for pedestrians. We recognize that bus stop moves have an impact on our customers and we thank everyone for their patience while we improve Commercial–Broadway Station. 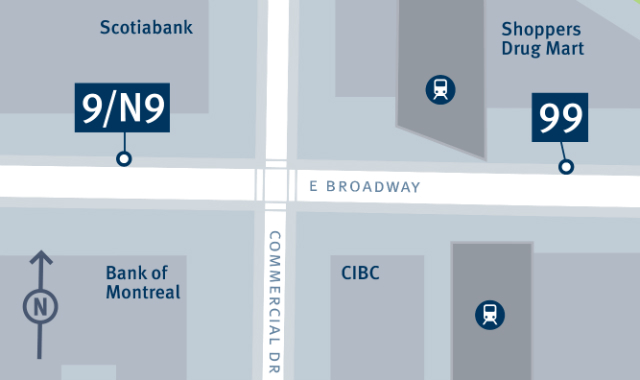 **Please note** The 9/N9 stop will remain in its current location on the other side of Commercial Drive. What will the upgraded station look like? An additional platform for Expo Line trains, a widened crossing over the Grandview Cut and a new walkway over Broadway to enable the system to expand for future customers, particularly as our region grows. New elevators and up and down escalators to improve access for customers with disabilities. More information about the Commercial–Broadway Station upgrades and project benefits can be found at translink.ca/commercialbroadway. Free transit on NYE for the 40th year! Transit funding announcement for B.C.